Food for the body and eye candy for winter-weary souls. From the kitchen of One Perfect Bite...Some folks called them Chinese donut sticks, but these long strips of fried dough are far more like bread sticks than donuts or crullers. 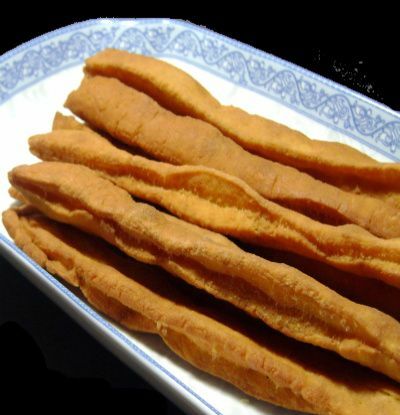 You tiao, or oil-fried ghosts, are usually served with a traditional Chinese breakfast of rice congee or salted soy milk. Both are bland and are an acquired taste for the Western palate. The salty bread sticks help add a recognizable dimension of flavor to an Eastern breakfast. The strips are made so they can be torn, lengthwise, into two long pieces after deep frying. Chinese folklore tells us that two dough strips, one male, one female, were layered and joined in the center, as an act of protest against the official Qin Hui and his wife who plotted to kill, or dishonor, a revered general named Yue Fei. It's believed that their traitorous behavior was punished by boiling in oil. I leave the fate of their remains to your imagination. Keeping in mind the fact that most Chinese homes have no ovens, I think you can see how these salty sticks became popular. I'm featuring them here as a curiosity for most, but as an exploration for those with more adventuresome palates. They are really simple to do and are worthy of a one-shot. I do ask you to keep in mind the fact that these are nothing more than exotic bread sticks. Please don't slay the messenger. Here's the recipe. 1) Combine flour, baking powder,salt and baking soda in a large bowl. Make a well in center of mixture and add 6 tablespoons of water, stirring to mix with a spoon until a soft dough forms. If necessary, add additional water, a tablespoon at a time, to form dough. Knead lightly in bowl until soft dough forms, about 30 seconds. Cover with plastic wrap and let sit for 15 minutes to relax gluten in flour. 2) Lightly flour a work surface. Turn dough onto surface and knead for about 30 seconds. Roll dough into a strip that is 16 x 4-inches in size. Cut crosswise into 20 3/4-inch strips. Pair and stack strips. Press each pair down the center with a chopstick to seal. Lightly stretch dough, working from center to ends, until each strip is about 10-inches long. Cover lightly with plastic wrap. 3) Using a high sided saute pan or a wok, pour in oil to a depth of 2-1/2 inches. Set over high heat and bring oil to a temperature of 350 degrees F. Place three to four strips of dough into pan and fry, turning often, until they turn golden brown, about 1 to 1-1/2 minutes. Remove from pan and drain on layers of paper toweling. Continue procedure until all dough strips are cooked. Serve at room temperature. Yield: 10 donut strips. Fantastic shot and nice recipe !! Great post !! Come and visit me sometime! You're right! Yummy for the belly and beautiful flower to see! What a pretty little flower pot and flower. These chinese donut remind me of Churros without the sugar. You've reminded me that I MUST buy a little pot of pretty today. I will! As always, Mary, a very interesting and informative post. Primroses are a colorful sign that spring will be here soon, although that is hard to believe on a day like today. Lovelypots - these doughnut sticks look tempting right now. And the flowers... oh the flowers. They might be tempting, but right now, I'd like something warm, like beef stew. I need warming up. Happy Blue Monday, Mary. Mary, fascinating story. I must admit I thought these would be a sweet donut stick, but I bet that they are great just the same. The small flower pot does remind us that Spring is just around the corner... many thanks. Pretty, sunny flowers, Mary! I have never heard of the doughnut sticks before, and love that you introduced me to them. I've never tried a doughnut stick, it sounds yummy. Lovely flower too. Those look SO yummy! I'm sure they are healthy too... right? I can't wait to try and make them! ahhh...loved your story, as always. The flower is a delight. This recipe sounds much like my deep fried puffs...it's a wonderful recipe and can be used many ways. Thank you for sharing a yummy recipe again. I might just have to give that a try. Your pictures are very tempting..yum! Ghost sticks! You come up the most interesting dishes! I have never heard of or seen these before. I'd like to try them! That Tuscan bean soup below this is also calling my name! Have a good week Mary! wow that is great shot and the recipe is awesome. Happy MYM! 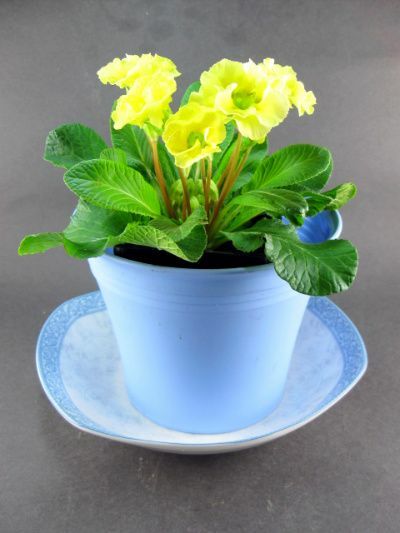 Pretty yellow flowers in your blue planter. I don't think I've ever tried these before but as a bread lover, I suspect I'd like them. Love the story behind them. Would be interesting to taste. It looks so crispy and delicious. I love the plant too. Birthday Cake for mellow yellow monday! Oh those look so delicious. Party Favors for blue monday! Those pics are so beautiful and love ur write up and precious knowledge. Those Chinese doughnut sticks look like a bite of heaven! Mary, you are a delight. You are just so real. Love the flower. My spirit needed that! That's so neat! I like their name! Looks yummy Mary! I always like recipes that other people have tried and said they were really good. I'm not too good at going into a cook book and picking something I've never had before! Enjoy your posts as always! How interesting! I love to learn about food from other cultures. very interesting info. thanks for sharing this with us. i never tried tthat Chinese Donut stick but i love their congee. Thanks for the comment anyway. Oh the Blue pot is really nice. These remind me of yummy Churros.Thanks for sharing the story and recipe. I'll make the Chinese Ghost Sticks with my girls, perhaps for Chinese New Year! Very interesting recipe indeed. Love the name oil-fried ghosts. Hello Mary, I was sThank you for your sweet comment about my uncle. He was a blessing to our family. the bread sticks are probably good but I would like them to have cinnamon and sugar. My sweet tooth. HA! I loved the story you shared. I promise not to kill the messenger. After spending 5 days in Atlanta with an antique show and coming home to my cousin Bob, my visiting has taken a backseat to so much activity. My cousin leaves tomorrow so life should be less busy. I have missed you too. Well done, Mary! haha... Even I haven't try making them myself. But they need to look a little more fluffy! I'm not sure if you can get the ammonia powder at the Asian food store over there. Ammonia powder is used in 'char siew bao' and 'you tiao'! So sorry, Mary! That supposed to be ammonium powder instead ammonia powder. Primroses are such welcome plants this time of year! A question for you. Why use self raising flour in this recipe? Since self raising is effectively flour, salt and baking powder wouldn't it be easier to simply adjust those ingredients in the recipe and use all purpose?